This recipe is very versatile. Add your own twist and have fun with them. This recipe makes 2 dozen tablespoon sized Coconut Joys. Please note the refrigeration time needed. 3 cups sweetened or unsweetened shredded coconut up to you! Melt butter in saucepan over medium-low heat. Watch the butter to ensure it does not burn. Reduce the heat to low and add the powdered sugar and coconut. Mix well and remove from heat after a minute or two. Allow the coconut mixture to cool slightly if needed. Using a small cookie scoop, scoop out tablespoon sized balls of the mixture and place on your Heirloom Cookie Sheet. 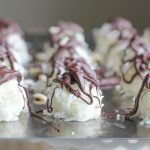 Drizzle the melted chocolate over all of the coconut mini-mounds. Chill in the refrigerator until firm, or for at least 2 hours.